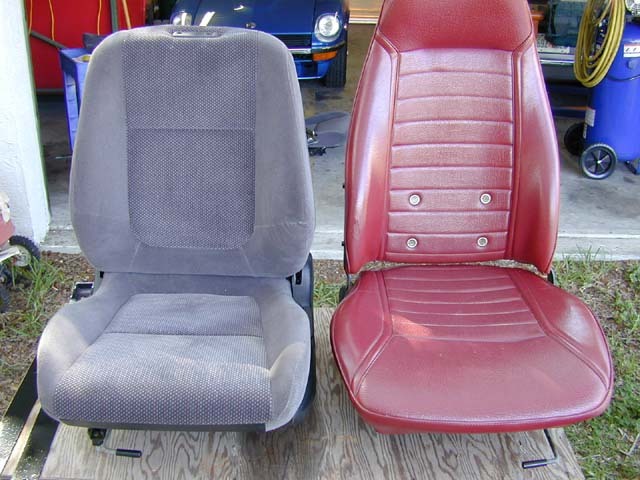 For people who want a better seat in their now 28+ year old 240Z's, but who do not want to spend a fortune for them - this article is intended to show how the Acura Integra Seats (96-98) fit in the 240Z. I'm getting old - and the seats in my 72 240Z are also. That's not the best combination for long comfortable drives in my favorite GT. I wanted, no - I needed seats that offered better support to both my legs and back. I also didn't want to have to pay $750.00 to $1,250.00 for a brand name. 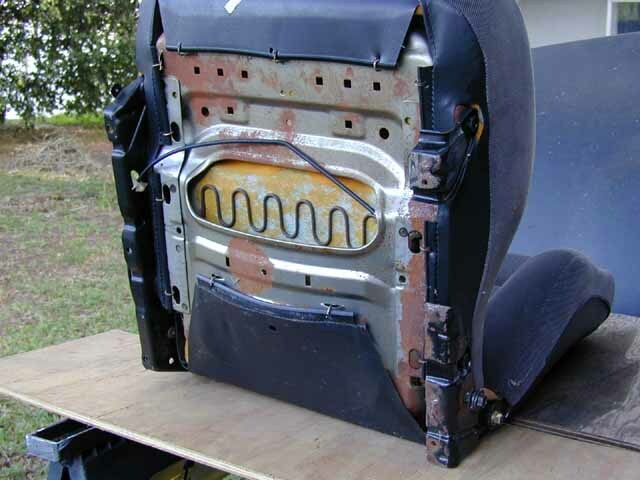 Over the years many manufacturers have offered superior seats in certain performance cars within their model line up's. Unfortunately, most won't fit in the 240Z's. 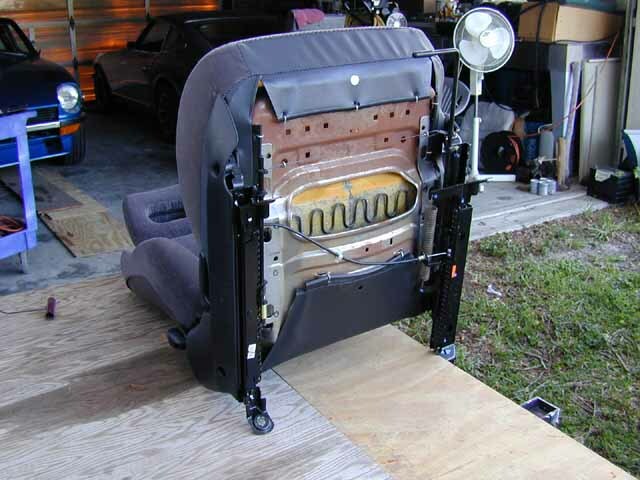 So the search for a seat that fits in the 240Z, offers better support and is affordable has taken much time and effort. The seats out of an Acura Interga 96-98 model years seemed to fit the bill for me. Stage one was to fit them into the car. Stage two will be to have them retro fit with TempraFoam and re-covered with burgundy cloth to match the original interior colors. I'll also be making some refinements to the retro fit (more on that later). 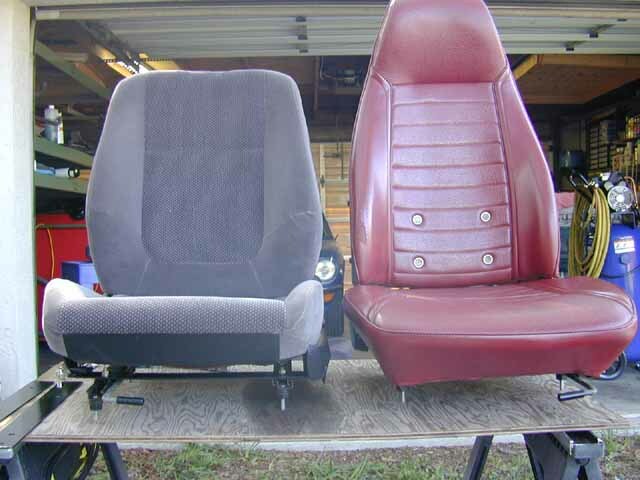 Pictured below are a couple of shots showing how close the OEM 240Z Seats are in size to the Acura Seats. 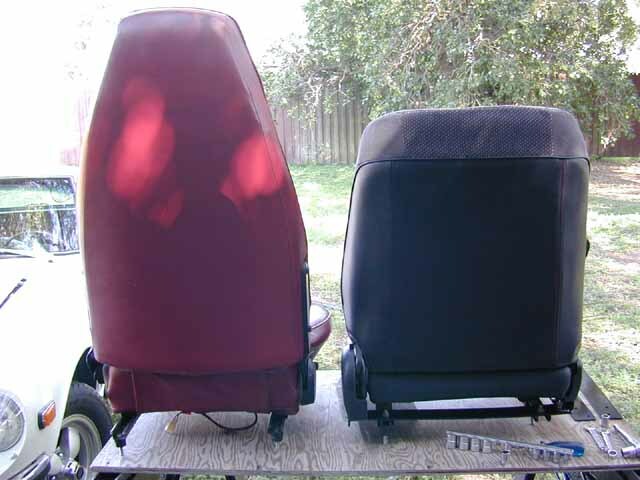 You can see they are both about the same length and width as far as the seat bottom are concerned. You will also note how much better condition the newer seat cushions are in! Looking Below: - You can see that the Acura seats are about 1 inch wider than the OEM seats. 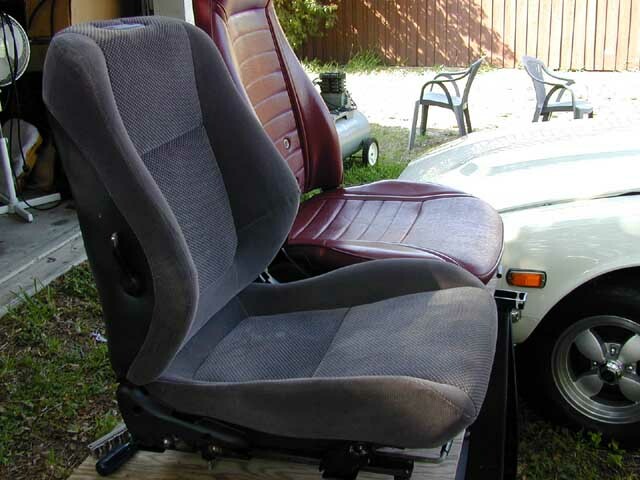 Looking Below: The 240Z Seat is about 18 1/2 inches wide at the back of the seat - you can not use a seat that is more than an inch or two wider. Even then, you have to be sure to mount the seat in the correct position to assure it will travel it's full rearward adjustment. 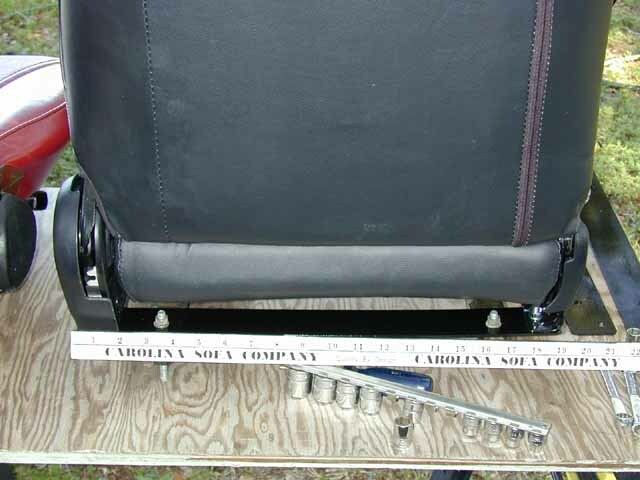 Below - you can see that the front of the seat bottom on the Acura seats offers more support under the front of your legs. You can also see that the lumbar support area of the Acura seats is better, plus on these seats it's adjustable within a small range of travel. 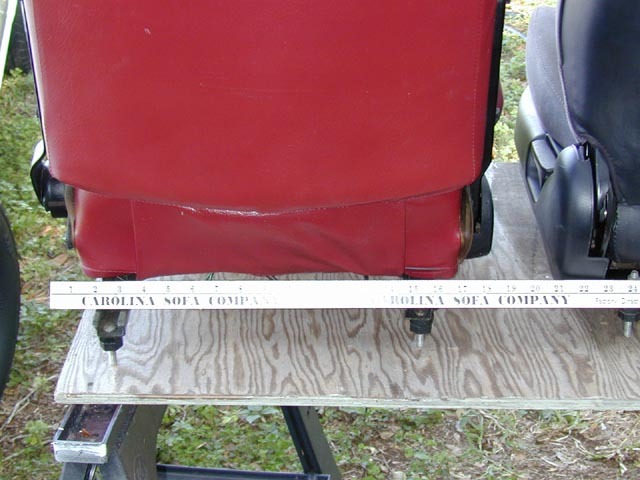 Below: here I have both seats mounted on the same 240Z Seat Tracks - so this is about the way they will sit in the car. You will note that they are about the same height at the front of the seat cushion.. The Acura seats have the advantage of adjustable head restraints - show removed here. Here you also note that the Acura seat is a bit wider across the seat back - at the front of the seat. 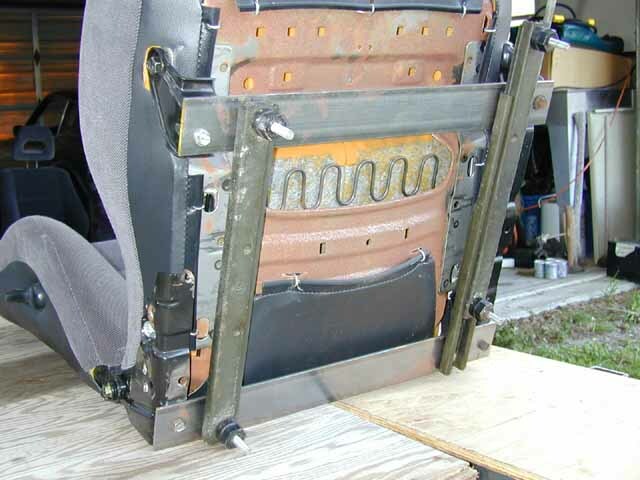 To install the Acura seats you have to first remove part of the original seat tracks. Below - you can see the OEM seat mounting brackets. One side unbolts and comes off, the other side has to be removed by breaking the spot welds. Below - here is what the seat looks like with the OEM mounting brackets removed. Below: you can see the new seat brackets that need to be made - to mount the 240Z seat tracks. You need 1/8th inch steel, 2 inches wide and 18 1/2 inches long. You also need 8 each - 8mm bolts, nuts and lock washers, to bolt the new mounts to the Acura seats. You'll be using one mounting hole, and a welded nut that exist on the Acura seats - that is why you need the 8mm bolts. The existing holes in the Acura seats are made for 8mm bolts. The 240Z seat tracks then bolt to the brackets using the original nuts/washers etc.